I had the pleasure of working again with the Porsche GT3 Cup Challenge Canada professional race series, this time at Circuit iCar built on the apron of the Montréal-Mirabel International Airport. 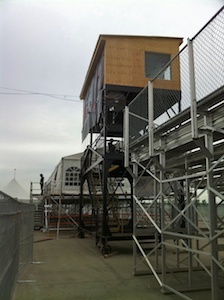 The weekend headliner was NASCAR Canadian Tire Series. Castrol Canadian Touring Car Championship and some regional sedan classes were also on the schedule. One bonus for myself is that I could practice my French. I tried to use only French any time I could, although I sometimes had to fall back to English if I could not understand. The weekend was interesting in the control tower. The three-story tower itself was built the day before. It was an enclosed wooden upper story, and the base was steel. The base had big steel wheels; the tower had been pushed into place the night before. It was a bit scary, as it would sway in the wind and provided little protection from the noise. I had a chance to meet Wayne Pollock, one of the Quebec clerks. To gain more experience, perhaps I can try working with him next year if there is an opportunity. The Porsche series races ran smoothly, although one competitor wrote off his chassis Saturday morning and the series leader broke his suspension at the start of the Sunday race, leaving only four cars to complete the 45 minute race. 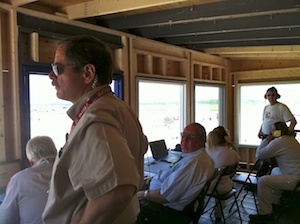 I snuck up to the control tower to watch some of the NASCAR folks, and it was chaos. They all had hoarse voices as if they were long time chain smokers. I think it from yelling over the noise for season after season. The noise from the cars was overwhelming. There were times I was standing next to someone and could see their lips moving, but could not hear them at all. During the weekend, I crossed paths with former Formula-1 World Champion Jacques Villeneuve. Someone told me that he was a good friend with one of the announcers covering the race.